Watering the family apple orchard, elderly farmer suffers deep bite wounds in shocking incident as a massive wolf pounces on him. 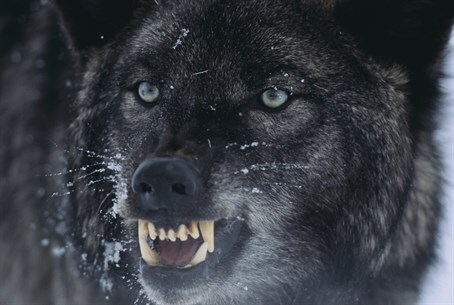 In an unusual case of wildlife and man literally meeting violently face-to-face, a wolf on Friday morning bit the face of a 75-year-old Druze farmer from the village of Buqata on the Golan Heights. The farmer, Mahana Shams, was attacked by the wolf while working in his family's apple orchard, and was left lightly to moderately wounded, reports Walla!. Shams was evacuated to the emergency room of Ziv Hospital in the northern city of Tzfat (Safed), while suffering from serious cuts from the bites on his face and hand. He was given an immunization against rabies, and will remain under the watch of the hospital staff while receiving antibiotic treatment to prevent the infection of his large wounds. Shams' son Teisir, who brought his wounded father to the hospital, said that the elderly farmer goes out every day in the morning hours to water the apple orchard. According to Teisir, on Friday around 6:30 a.m. while Shams was busy watering the orchard, the wolf suddenly pounced on him. It first bit his hand, and then bit his face, leaving cuts on his neck, lip, cheek and causing him to have a large black eye. The 75-year-old managed to break free of the massive canine and caused it to run off, and afterwards drove back home in his tractor while wounded. From there his son drove him to the hospital.